This multi-purpose organizer has 7 see-through zippered compartments which are gusseted and raised to allow for larger thread spools if necessary. 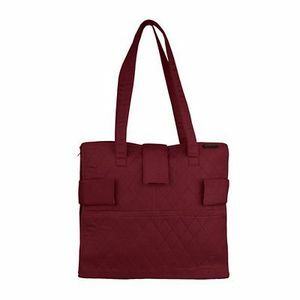 The bag has generous shoulder straps and is secured with 3 Velcro straps that make for easy portability and storage. Included in this bag is a separate zippered clear pouch to carry your books patterns or fabric blocks and an external pocket. The different storage configurations in this bag make it ideal for multiple uses.